Buenos Aires travel like never before! Its geography, its people, its stories, its cuisine, its fashion! The Buenos Aires Secrets Tour, is an all inclusive 7 days, 6 nights reality history tour of Buenos Aires, Argentina. Allow yourself to be transported in time. Connect and get to know a Buenos Aires very few know. The Buenos Aires Secrets Tour, has unique historical content “such as stories of secrets, murders, famous actors/actresses, war secrets, and monarchies“ it took historians 13 years to develop and has been endorsed by the governments of France and Argentina. Learn to dance Tango, discover the secrets of Buenos Aires and the culture and cuisine of its people! This is an experience you should not miss. Buenos Aires is one of the largest cities in the world; a megalopolis with over eleven million inhabitants in both the city and its surroundings. It is also the most elegant and the busiest city in South America which represents the Argentine essence. Buenos Aires is a city with its own personality, open to the World’s architecture, culture and art; cosmopolitan and contradictory, dynamic and traditional, historical and avant-garde. Stay at wonderful one and two-bedroom apartments and have all the comforts of home but abroad! This all inclusive vacation is packed with Buenos Aires sightseeing tours! Travel all over Buenos Aires! La Boca, Barracas, Palermo, Barrio Norte, the Government Palace , Congress, Plaza San Martin, Recoleta Cemetery, the Alvear circuit, San Telmo (colonial Spanish neighborhood), Mayo Avenue, Corrientes Avenue, the Café Tortoni (the oldest bar in Buenos Aires), the 9 de Julio avenue (the widest avenue in the world), the Malba Museum (a replica of the Guggenheim), Las Heras Avenue and much more! Learn to dance tango and enjoy a tango show! Experience the nights of Buenos Aires! Immerse yourself in stories of murder, Mussolini, military torture, Evita Peron, President Roosevelt, KGB, Jewish Buenos Aires, Carlos Gardel, the Nazis in Buenos Aires, the British Invasions, immigration stories, mafia, and love! Have dinner at one of the famous Puerto Madero restaurants, get ready for traditional Argentinean steak dinners at internationally acclaimed restaurants and take pleasure on Buenos Aires high-end lunches! Afternoon shopping tour with the best Buenos Aires brands. Your own Buenos Aires Secrets book!!! Argentina history travel at its best! DAY 1: The Buenos Aires Secrets All inclusive vacation starts when you arrive to the Ezeiza airport where you will be transported to your apartment. You will then be picked up to enjoy a welcome lunch at a local restaurant. In the afternoon you will visit La Boca (Caminito, Boca’s Stadium and Museum) and Barracas – and listen to stories of murder in Argentina. 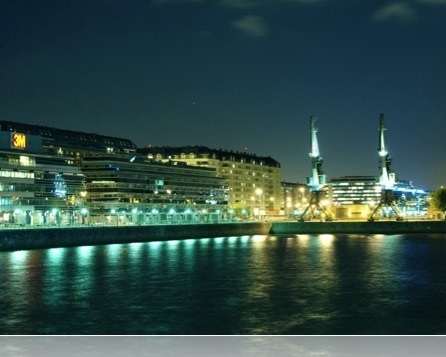 Dinner will take place at one of the famous Puerto Madero restaurants. DAY 2: Breakfast and afterwards visit Palermo; Barrio Norte, downtown Buenos Aires! Today enjoy the unique All about Evita Tour: Listen to Evita’s voice! Casa Rosada or Presidential Palace, CGT, the Congress and Plaza San Martin sightseeing tours. Return to the apartment to get ready for a traditional Argentinean steak dinner at an internationally acclaimed Buenos Aires restaurant. DAY 3: Be ready for our famous Recoleta Cemetery Tour, the architecture of Paris in Buenos Aires tour, and lunch at a high-end restaurant. Later, the exclusive Jewish Buenos Aires tour and the tango tour that includes the house of Carlos Gardel, a typical 5 o’clock tea followed by tango lessons. In the evening you will enjoy dinner with a Tango show and dance. DAY 4: Morning breakfast and tour of San Telmo (colonial Spanish neighborhood) where you will be able to shop for wonderful antiques! Then the Onassis route and the Nazis in Buenos Aires tour. Afternoon shopping tour. DAY 5: Depart on a tour of the famous Mayo Avenue and hear incredible stories. A stop at the Café Tortoni, the oldest bar in Buenos Aires to continue along Corrientes avenue, the Obelisco and the 9 de Julio avenue, the widest avenue in the world. Lunch at Puerto Madero followed by more astounding Buenos Aires history. For dinner, the famous pizza and pasta of Buenos Aires followed by drinks at a local pub. DAY 6: More shopping and a visit to the Malba Museum (a replica of the Guggenheim), followed by more Buenos Aires sightseeing tours. After a wonderful steak dinner you’ll have a chance to keep on practicing your tango steps at a local joint. DAY 7: Morning: Romeo & Juliet in Buenos Aires. Farewell lunch at a top Buenos Aires Restaurant. Back to the apartment to pack and relax and transportation to the airport. -The Apartment stay includes the room double occupancy rate and all of its services. Hear Rita Hayworth’s stories * Murder in Congress * Famous writers stories * President Roosevelt stories * Puerto Madero tour * Nazis in Buenos Aires * Tango lessons and Tango show * Buenos Aires nights * Jewish Buenos Aires tour * Caminito sightseeing tour * Evita * The Graf Spee combat between Germany and the Allied forces in Buenos Aires * Haute cuisine * Buenos Aires shopping tour * Argentinean meats * Buenos Aires city tour * Gastronomic tour * The Obelisk * Recoleta Cemetery Tour * KGB secrets * Architecture of Buenos Aires sightseeing Tours * Juan & Evita Peron * Sordid jail stories * Butch Cassidy in Buenos Aires * Recoleta Cemetery true stories * A visit to the Malba museum * A Buenos Aires art tour * Romeo & Juliet in Buenos Aires * Travel in time and travel in style!